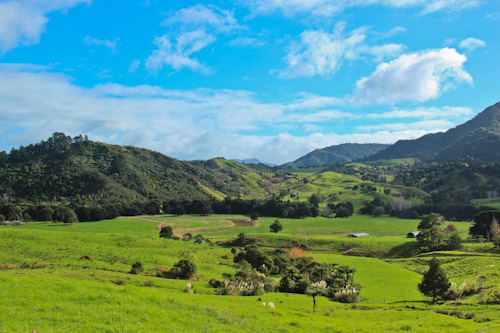 While waiting for our truck to be repaired, we decided to take some day trips from Kaitaia so that we could explore more of the countryside that resides so deep in our appreciation. The western coast of the Far North is largely inaccessible by road, but we headed that direction anyhow. During our drive, the rolling hills provide great vantage points of enjoying the scenery. 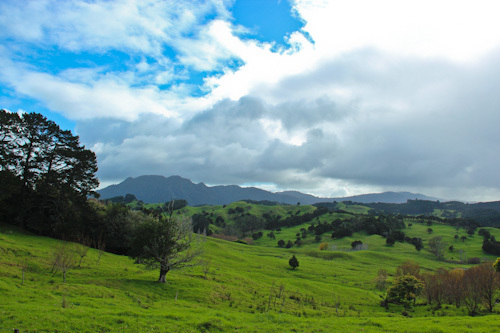 The countryside is beautifully green with a smattering of native bush. 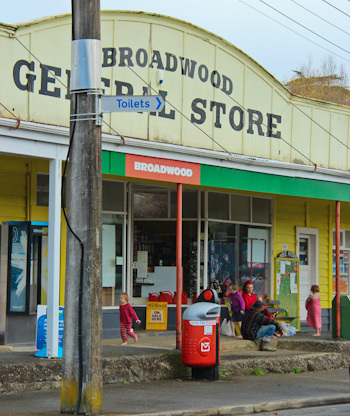 We stopped at the tiny township of Broadwood — mostly to let the girls stretch their legs and to get something to eat at the general store. While positioned outside the shop, we chatted to anyone and everyone who passed through the doors. 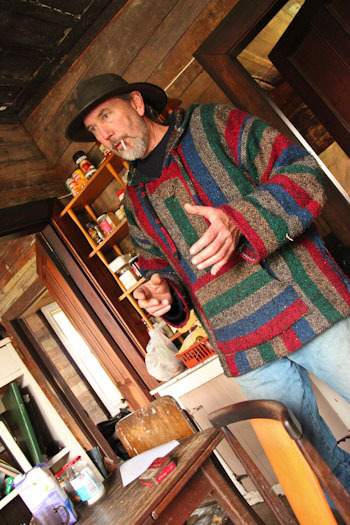 Two Maori men told us about collecting watercress from a local waterway. A tattered flag hung from their rear antenna. I asked about it, and the driver explained that it was the United Tribes banner, the first official flag of New Zealand and chosen by Maori and British delegates in 1834, but was discarded in favour of the Union Jack in 1840 after the Treaty of Waitangi was signed. We were still sitting outside the shop when Brian sat down to put his boots on. 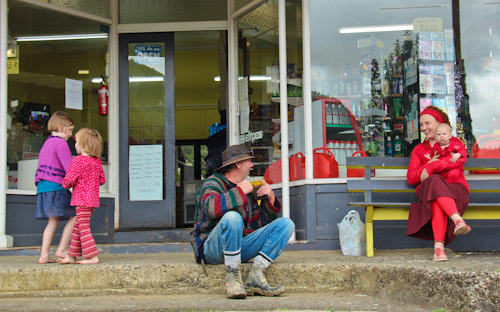 In muddy localities, it's polite to remove one's gumboots before entering a shop. Brian explained that he wasn’t long returned from the United States where he had worked as a project manager for charity construction organisations including Habitat for Humanity. We started talking about spiritual matters and when Brian quoted Now is the day of salvation!, we realised that here was someone special — a fellow traveller on the path of righteous enlightenment. Following our friendly conversation, Brian invites us to come home with him. We followed Brian home as he rode his quad bike (4-wheel-motorbike) back down the road and then onto a gravel track into the countryside. The road was muddy and slippery, and David marvelled at our little van’s capabilities, reaffirming once again that our latest travelling accessory was the right purchase decision. Without it, we wouldn’t be on the road today, and we certainly wouldn’t have met Brian! 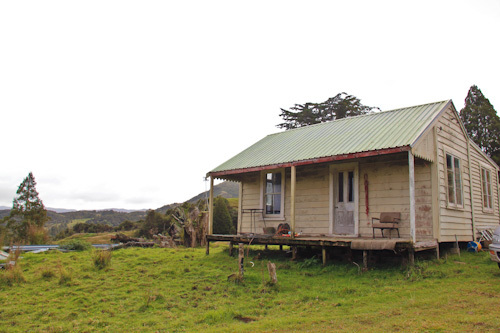 Brian's home is a remote cottage owned by an Auckland friend. 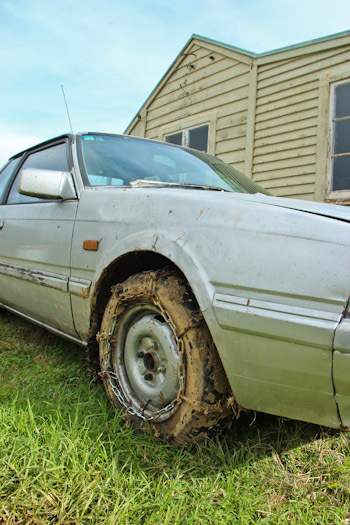 The track to the house is so muddy and slippery that Brian has attached chains to his car wheels so it has enough grip to get on and off the property. Our first stop in the house is to greet two possums, kept conveniently in the bathtub. For various reasons, Brian didn't kill these two when he caught them in his traps, but they're not expected to survive the winter. Brian raises extra money from selling possum fur. It fetches $140 for a kilo. 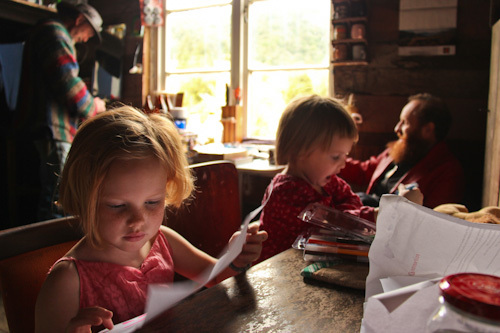 As Brian makes us a cup of tea in his kitchen, our girls sit down with pens and paper — a fantastic entertainer on a wet day like today. Brian's home is fully furnished but dusty and disused. He's only been living here a couple of weeks and is slowly cleaning the place room-by-room. 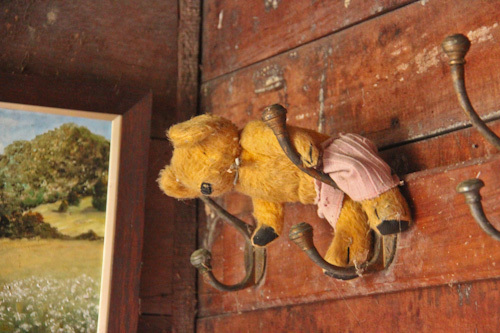 An old teddy bear hangs up high, neglected. I wonder what stories he could tell of this house. 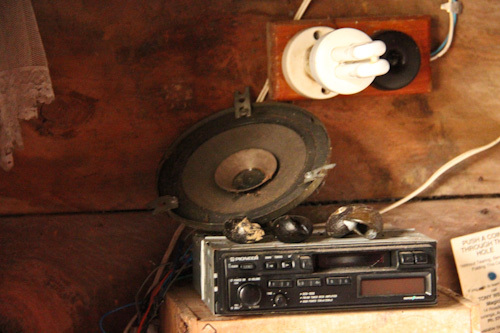 A car stereo runs on the 12-volt solar-power system and provides the entertainment in quieter times. We've been enjoying Brian's stories of his time overseas. 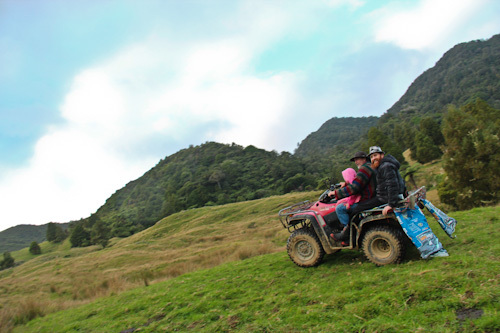 The rain stays away so Brian takes Brioni and David on his quad bike for a ride around the property. When David and Brian came back from their bike ride, they let me know that we were spending the night on the property. Although we only came with provisions for a day-trip, there’s enough bedding for us all, and we’ll be able to be warm and comfortable tonight, with our family sharing three single beds in one room. It’s nice to be welcomed into someone’s home — whatever state it’s in. I’m aware that we’re a large family with young children — a state that intimidates even me sometimes, and so when someone invites us to stay, I think they’re pretty courageous! Our true comfort does not depend on the quality of our surroundings but on the emotional and spiritual plane which our minds inhabit. 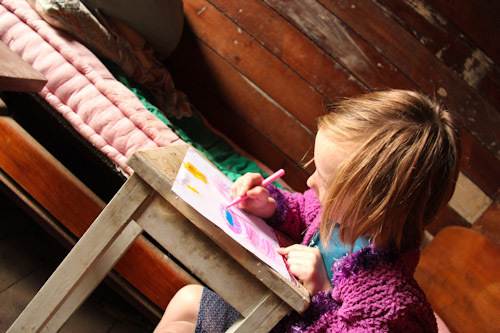 Our children take their cues from us — so we’re all happy here and eager to hear more of Brian’s remarkable life. It’s funny to me that after receiving Ammi’s high praise of our parenting style, Brian is certain that we’re doing a lot very wrong. In no uncertain terms, he’s told us what he thinks and is happy to advise us based on his experiences with his own four children, work with youth groups, street kids and volunteers. 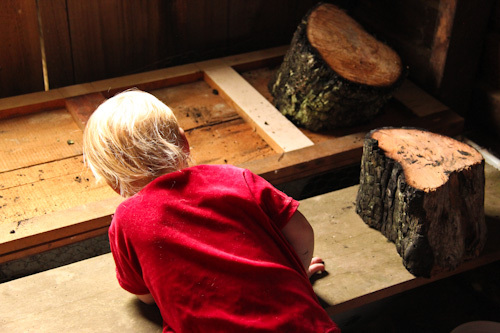 We listen to what he has to say and will consider it — not because we think we’re parenting wrong but because we know we have room for improvement. We’ve only known Brian for a couple hours, and he judges our parenting style as woefully inadequate. It’ll be interesting to see if he changes his mind after he knows us better! I’m interested to know what he thought you are doing wrong and what caused him to tell you? Whilst I agree what one person thinks is right another may think is wrong, I’m intrigued to know what your beautiful girls (and boy) could/would have done to make him verbalise this judgement? It’s sounds lucky you and David were not offended. I find it odd how some people presume to tell others things like this.